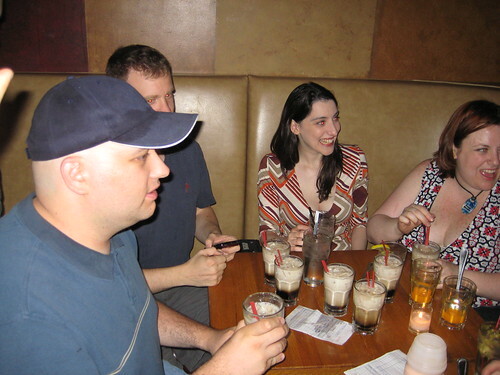 Last July, Rebecca, Stacey, Teek, Maria and I showed up in NYC with a list of finalists from our drink contest. Okay, maybe we didn’t exactly show up with a list of finalists actually in hand. Stacey spent an hour on her Blackberry, while buzzed, trying to find a place on the internet where we may have had that list stored. Fortunately, she found it and saved the day! What we lacked in physical preparedness, we made up for with enthusiasm, determination and desire to drink your drinks. Once we got our list of drinks and recipes together, our waitress and our bartender were awesome enough to make trays of the drinks for all of us. They were unbelievably patient and accomodating considering we were asking them to make drinks containing dry ice, frozen gin, American flags and ice cream. Add ice if youâ€™re a puss. belt of radiation (i.e., shine a light on it). Decorate with a teeny tiny little flag. -Over the back of a silver spoon float a measure of Qualactin Hypermint extract, redolent of all the heady odours of the dark Qualactin Zones. -Drop in the tooth of an Algolian Suntiger. Watch it dissolve, spreading the fires of the Algolian suns deep into the heart of the drink. Unfortunately, we were forced to make some ingredient substitutions and exclusions for some of the drinks. We were unable to get bananas at the bar nor were we able to get dry ice or mint. We didn’t have flashlights or radiation belts or industrial freezers filled with frozen booze and there were no flags in our drinks that said “Your kid is dead”. There was no ice cream. If these would have made a difference, and you lost points because of it… well, that’s the breaks kid. Part of us judging your drink was our ability to actually make the drink. Maybe your drink wasn’t ready to face the big city and undergo the scrutiny of a group of smart, drunk, hot chicks… but really, you all fared rather well. 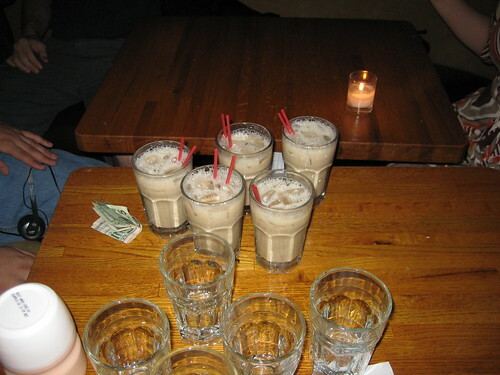 NASA Moon Hoax – while generally delicious, this drink lacked a proper proof and was essentially a milky White Russian.Â A good drink for your grandma or your girlfriend who needs to be cut off but will freak out and start stabbing people if you actually cut her off. High-hatted Creamed Chocolate Monkey – At Skepchick HQ, during the semi-finals, this drink was a huge hit with Rebecca.Â Perhaps it is a truly amazing drink. Ultimately though, we did not have the key ingredients (ice cream and an edible phallus) to make this drink what it should be: good. Buzzed Aldrin – The fact that this shot is a “runner up” is, in my opinion, a travesty. This drink is AMAZING! I tried to give it a boost by giving it a 10 out of 5 in one category… but it wasn’t enough. I’m sorry, Buzzed, I failed you. Sylvia Browne!! – A drink that is tastier than anything you can imagine (save for a Buzzed Aldrin), but what really makes the drink is the”Your kid is dead” part; it adds new dimensions of fun to the drinking experience.Â We weren’t able to fashion any flags to put into the drink, so we had to improvise. One of my favorite memories of my entire NYC trip, one that still makes me giggle, was right before we drank our Sylvia Brownes, we held our glasses up in the air and yelled “YOUR KID IS DEAD! WOOOOOO!” It was an incident that made the nice lady blogers from Skepchick.org appear to be nothing less than Michael-Jackson-insane.Â Two words: Awe Some! Congratulations to Justin! Use the contact us form to send us your address and Rebecca will send you your much awaited SurlyRamics necklace! Runners up, use the comment box to tell us where to psychically channel your prizes of our love and appreciation. A huge thank you to everyone who participated.Â This contest was amazing.Â Not only did we manage to have a great time and get hammered, but we also managed to put together what is hopefully the first of many Skepchick podcasts – all because of YOU! “Your kid is dead!”? Hehe, that’s so baaad but so funny. Do you have to say it in like a spooky gutteral Poltergeist way too? Awesomely funny. Don’t suppose you guys are gonna do some video podcasts sometime huh? Would have paid good money to see this one. Can I just add that I snorted Tang? here’s what i would have suggested. hereâ€™s what i would have suggested. Uhm, you left the rum out of the pan galactic gargle blaster. It was supposed to be rum, club soda, frozen gin cubes, crushed mint leaves and sugar cubes. That would be a different drink than what I just saw. I’m still psyched that I made runner up. @Gabrielbrawley: Basically it is a mojito with ice cold gin. I didn’t get to try the actual recipe. However, Carrie loved it when she tried it at home. Pay no attention to that Masala Skeptic… she doesn’t get it when it comes to gin. I think that would actually be considered a homeopathic cure for heartburn. @Masala Skeptic: Please let us know how your experiment comes out. If Tang works that well, I’m going to go buy a 55 gallon drum of it. You should buy a 55 gallon drum of it anyway… and make Buzzed Aldrins all weekend! Let me get this straight, you dissed the NASA Moon Hoax for being a creamed-down (pardon my innuendo) White Russian, but you ultimately selected a drink consisting of wussy mixers that are 36-50 proof? Thanks for posting the excellent wrap-up, Elyse! I lol’ed at the memories. Ah. Not my call, I voted for Vodka. Also, I have a propensity to use champagne as a mixer whenever possible: Buzzed Aldrin + Champagne = sparkly heaven. First off, you are mixing champagne and Tang, so you already win. Plus it’s freaking delicious. But it’s a new drink and needs a new name… The Apollo 13? The Giant Leap? Build in a short glass of ice and stir. Garnish with a lemon peel. AMAZING!!! I’m glad that the Buzz Aldrin made the finals. It has been a mainstay of my bartending skills for ages. mix with cream soda to taste!